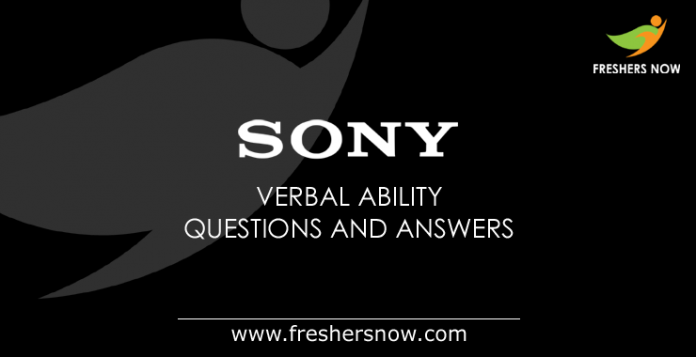 In this article, we have provided a sample Sony Verbal Ability/ English Questions and Answers For Freshers (2018, 2019 & 2020 Passed outs). Candidates who are preparing for the placement exams can check and practice the Sony Verbal Ability Questions and Answers with Solutions together with the Explanation. We have designed this post for the sake of applicants so that they will get an idea on the basic Sony Exam Pattern. Therefore, kindly refer to this article so that you can understand the difficulty level of the test. Based on that, you can have a chance to plan perfectly to crack the exam easily. Job aspirants should note that these are Sony Model Verbal Ability Questions and Answers but not an exact one. 1.2.3 Direction (Q. 9 – 10): Sentence Correction, Choose the wrong sentence and correct it. Not only the topics mentioned earlier, but you should also refer the remaining topics, as well as chapters present in the verbal section following, are sentence correction, sentence improvement, passage completion, reading comprehension, active & passive voices, tag questions, etc. Therefore, this page helps you a lot because we have provided the Sony Verbal Ability Questions and Answers with Solutions according to the test pattern. The main ambition of each and every student is placing in a reputed company like Sony. So the candidates who are willing to gain knowledge in grammar can prepare Sony Verbal Ability Questions and Answers. However, HR’s of any company will recruit the most skillful and dynamic students for the desired roles. So, aspirants make sure that, by practicing Sony Verbal Ability Questions and Answers with solutions you can cover all the topics of the verbal section that results in the achievement. Moreover, you can download Sony Verbal Ability Questions and Answers in PDF format at the end of this article. Explanation: Widen – make or become wider. Explanation: Float – rest or move on or near the surface of a liquid without sinking. Explanation: Surmount – overcome, it seems difficulty or obstacle. Explanation: Scorn – a feeling and expression of contempt or disdain for someone or something. Explanation: Obscure – not discovered or known about; uncertain. Clear – easy to perceive, understand or interpret. Explanation: Callous – showing or having an insensitive and cruel disregard for others. Sensitive – quick to detect or respond to slight changes, signals, or influences. Explanation: Conform – comply with rules, standards, or laws. Differ – be unlike or dissimilar. Direction (Q. 9 – 10): Sentence Correction, Choose the wrong sentence and correct it. 9. In the one case, the populist draws a bad xenophobic conclusion / from a good premise of a sensible skepticism about / the inadequacies of what can be delivered / with supranational banking and financial elites. D. with supranational banking and financial elites. Answer – D. with supranational banking and financial elites. It should be ‘by’ instead of ‘with’. by – identifying the agent performing an action and indicating the means of achieving something. 10. It is absolutely essential for all of them to get an education / that equips them with the skills, especially job-oriented / vocational capabilities if the expectation of / the demographic dividend is to be meaningful. D. the demographic dividend is to be meaningful. Answer – D. the demographic dividend is to be meaningful. Replace ‘the’ with ‘a’. The is used to refer to specific or particular nouns; a/an is used to modify non-specific or non-particular nouns. We call the definite article and a/and the indefinite article. Explanation: Second is the place where the first is kept for exhibition. Explanation: The ruler of Egypt were known as pharaohs. Similarly, the rulers of India were known as kings. Explanation: Preamble is the introduction to the constitution, similarly, the preface is the introduction to a book. Explanation: Salt consists of grains and glass is made up of chips. Explanation: second is the one who lacks the first. Hope, the information provided regarding the Sony Verbal Ability Questions and Answers For Freshers 2018, 2019 & 2020 Batches will be helpful the job seekers. You can visit our site www.freshersnow.com for latest updates. Thank You.